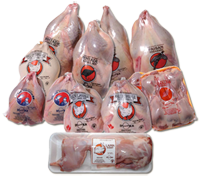 Rabbit and fine poultry such as Cornish hen, pheasant, guinea hen, quail and partridge sold fresh or frozen in vacuum packages. Mulard duck products including duck magret (breast), duck confit and foie gras. Certified organic chicken offered whole or in pieces (thighs and breasts), fresh or frozen. Gourmet Deli Products: Duck pâte and rillettes as well as block of foie gras are also available.